Contents: Introduction. Part 1 The Existence of the One God: Theories of causation; The existence of a first being; Perfect-being theology; The knowledge and volition of a first being; Divine infinity; Divine simplicity; Divine unicity; Divine immutability and timelessness. Part 2 The Trinitarian Nature of the One God: The Trinity and scientific demonstration; Internal divine productions; The number of productions; Divine persons; The commonality of the divine essence; Personal properties; Persons and essence in the production of Son and Spirit; Notional and essential acts; The constitution of a divine person; Anti-subordinationist strategies. Appendix; Bibliography; Indexes. - Publisher The Franciscan John Duns Scotus (c. 1266-1308) is the philosopher's theologian par excellence: more than any of his contemporaries, he is interested in arguments for their own sake. Making use of the tools of modern philosophy, Richard Cross presents a thorough account of Duns Scotus's arguments on God and the Trinity. Providing extensive commentary on central passages from Scotus, many of which are presented in translation in this book, Cross offers clear expositions of Scotus's sometimes elliptical writing. Cross's account shows that, in addition to being a philosopher of note, Scotus is a creative and original theologian who offers new insights into many old problems. 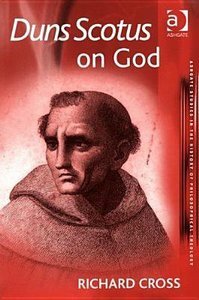 About "Duns Scotus on God"
The Franciscan John Duns Scotus (c. 1266-1308) is the philosopher's theologian par excellence: more than any of his contemporaries, he is interested in arguments for their own sake. Making use of the tools of modern philosophy, Richard Cross presents a thorough account of Duns Scotus's arguments on God and the Trinity. Providing extensive commentary on central passages from Scotus, many of which are presented in translation in this book, Cross offers clear expositions of Scotus's sometimes elliptical writing. Cross's account shows that, in addition to being a philosopher of note, Scotus is a creative and original theologian who offers new insights into many old problems.